There can be few better moments than knowing that you are safe coming into the last game of the season as a football fan. An away trip to a team at the top of the table takes on a different meaning and you can enjoy life a bit more. The air smells fresher, food takes better and even Harry Hill appears to be funny. It was the last trip for our Daggers Diary team on Saturday as they made their way to Shropshire, for once no longer the wettest place in England. It makes a change to go into the last couple of games of a season with nothing to play for. 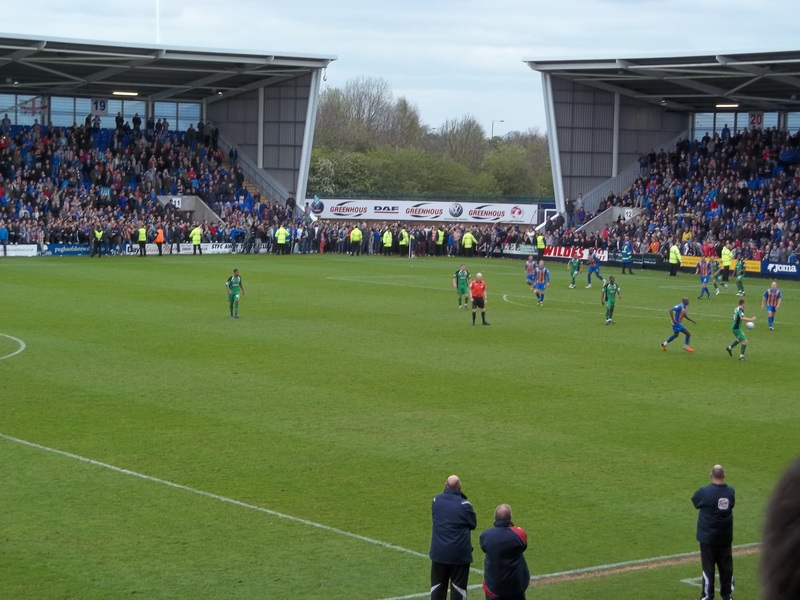 Last year, we were trying to stay in League 1; in both 2009 and 2010 we were trying to get into the play offs, while in 2008, we went into the penultimate game of the season up at Darlington needing a win (and results to go our way) to stay in the football league. The last time we had nothing to play for in the last couple of games was in 2007, having already secured the conference title. It makes for a nice relaxed trip to Shrewsbury, which is the venue for our last away game of the season. You would kind of hope that by this time of the year, we would be going to games in some decent weather, but since the drought was declared recently, it seems to have rained for most of the time since. As some have remarked, it must be one of the wettest droughts in recent times. Today is the last away trip of 2011/12, and we are making the trip westwards to Shrewsbury Town. The home side are in line for an automatic promotion place, and a win today will see them promoted to League 1. With this in mind, the game (aside from the away section) is a sell out, and so there will be around nine thousand home fans hoping to see them achieve their aim today. In contrast, there will be around 100 Daggers fans making the trip, which is around half of our allocation. Three years ago, we met on the final day of the season in what was basically a winner takes all game for the final play off place. Although we had a one point lead going into the game, the Shrews led 2-0 by half time, and it looked all over. Although we got one back early in the second half, an equalizer wasn’t forthcoming, and despite the best efforts of everyone, Shrewsbury held on for a 2-1 win, and thus took the last play off place. Over the course of a season, where you finish is where you deserve to finish, and over the course of that season, Shrewsbury deserved to finish in that place. Given that we had only just avoided relegation the previous year, it still represented a major improvement for the team. Although we have nothing now to play for, the coach is still full for what is effectively for us, a dead game. There are a few regulars missing, but most on board are familiar faces. Dagenham Dan for example, is venturing back into Europe this weekend with Neil Shenton for a play off game in Belgium, while others have decided to give this a miss. As we arrive at the ground a full ninety minutes before the game, there is already a sizeable amount of home fans out side the ground, waiting to get in. The bar at the Power League next door has already only got standing room only, and with the “designated” away pubs already looking full as we passed them on the coach, most head straight into the away end of the ground for a drink. The Greenhous Meadow is an impressive arena, with four completely separate stands. However, the corners look as though they could be filled in if a larger capacity was ever needed. There are at least half a dozen mascots for the home team today, and as the players warm up over on the far side of the pitch, the youngsters are kicking a ball amongst themselves on the side nearest to the dug-outs. All are resplendent in full Shrewsbury kit, and at least one has had her hair dyed blue for the occasion. If that isn’t all, then John Still takes a stroll into the away end prior to the game to thank the away fans for travelling, stopping to have a chat with some of our fans as well. I don’t think that I can recall ever seeing that before, and certainly not at a Football League level. It’s grey and overcast as the game kicks off, although the fact that it isn’t raining is a bit of a bonus, especially how it has been tipping down over the last few days. Given that there is only about 150 daggers in a crowd of around nine thousand, it’s going to be hard to hear the visiting fans. The home side start nervy though, as though weighed down by the expectation that today will be the day they win promotion. There is a good noise though from all involved, although much of the home vocal support is coming from the corner blocks of the west stand. The first freight train thunders past after a couple of minutes, but the first chance takes a bit longer to arrive. The impressive James Collins has a shot blocked by Scott Doe, but the rebound is blocked on the line by Damien McCrory. It’s a close call, and it begins a period of home pressure that continues with a curling effort from Ian Sharps which goes just wide. The home side are clearly targeting the left wing as their main avenue of attack, as the diagonal ball from right midfield to the left wing is tried out with varying degrees of success in the early part of the game. The game then starts to calm down a bit, with the ball not really sticking with any player that happens to come across it. However, this doesn’t last long, and soon there is another chance for Shrewsbury that is cleared off the line, this time by Scott Doe from Matt Richards. Shrewsbury are back on top, and the Daggers are not able to really threaten at the other end. Collins has another effort blocked by Doe, but the ball rebounds and the Daggers are able to break, with the ball quickly transferred to the other end, and it results in an effort by Medy Elito that is wide of the mark. It does at least make the Town keeper dive, although it was probably just so that he got his kit dirty. The advantage of getting a press pass for this game is that I have a slightly better view than most of the Daggers fans that have travelled. However, the corporate hospitality people are just in front of us, and one particularly middle aged gentleman is wearing not only a lilac jumper, but waving a flag as well. Annoying (and worrying) are just two words to describe this bizarre scene. The goal that Shrewsbury have been threatening eventually arrives on thirty eight minutes. A corner from the left is not cleared, and a cross by Nicky Wroe is headed home by James Collins. The noise generated is not only to celebrate the goal, but also a sense of relief that the deadlock is broken. Minutes later, Lewington is called on to make a save at the feet of Collins, and the danger is averted. The one minute of stoppage time produces very little, and the half time whistle brings a deserved home lead. The first fifteen minutes of the second half are largely dominated by the home side, anxious to get the second goal that will probably finish the game off. However, despite efforts by both Aaron Wilding and Terry Gornell, the score remains at 1-0, and you can feel the nervousness developing in the home crowd, especially after Luke Howell’s shot for the Daggers is deflected for a corner with Chris Neal in the home goal stranded. The last twenty minutes sees the usual flurry of substitutions, but no real change in the game, with Shrewsbury still maintaining their command of the game. Mark Wright shoots wide after good work down the right side by the substitute Marvin Morgan, while the former Dagger Morgan is also involved a few minutes earlier, although his cross is repelled by Abu Ogogo. The last chance of the game falls to the Daggers, but Josh Scott’s header is not enough to trouble Neal, and as the clock winds down to the final whistle, the locals start to mass on the side of the pitch. The idea of using the “Some people are on the pitch” springs to mind, but although there are a couple that enter the field of play prior to the whistle, most seem to wait until the game is actually over before running on. 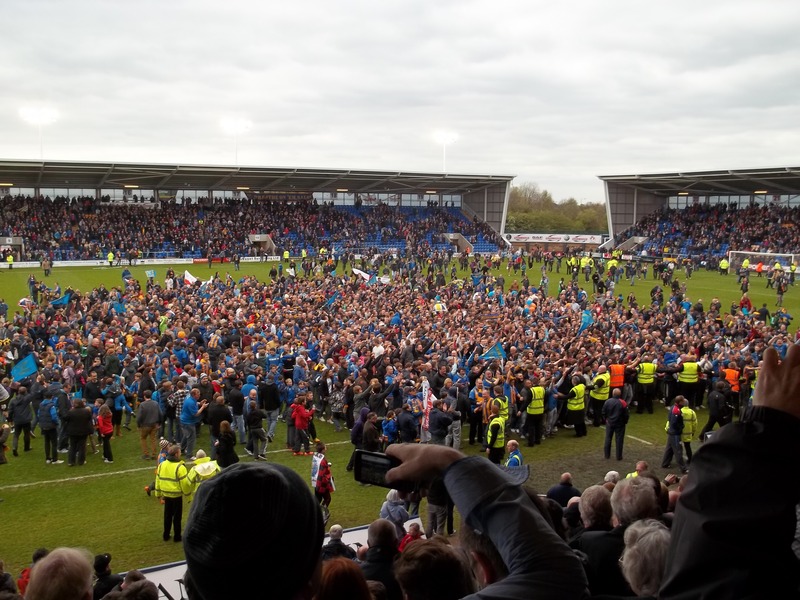 The three minutes of added time do nothing to the score, and at the end, Shrewsbury can celebrate a promotion to the third tier of English football. This entry was posted in Dagenham & Redbridge, nPower Championship and tagged Dagenham & Redbridge, nPower League Two, Shrewsbury Town. Bookmark the permalink.